Can Interpretation Be Both Subjective And Objective? Yes, it can. And even more than that, it will inevitably be both. Things become more sophisticated when we start to ask what is right instead of what is wrong. Obviously, there are many different ways to play a piece while producing perfectly convincing and beautiful music, and doing nothing whatsoever against the text. All of these interpretations will be objectively right, but still different. And this is where personality comes in: Each musician’s personality is unique. There will be overlaps between a composer’s and his interpreter’s personality — then the interpreter will probably play very much what the composer had in mind. There will be differences in their personalities — then the interpreter will perhaps not come close to the composer’s idea, but there is still a chance that the result will make sense and even be of a kind to find the composer’s surprised approval (and there is a chance that it will not; if a composer’s personality is too far from my own, I had, in some cases, better leave him alone). Take any of Horowitz’ recordings of the piece and verify that no music-literate listener would fail to note these accents. Now put any other pianist’s recording to the test whether these accents are audible at all. Was Horowitz really the only one to notice this highly interesting, curious, and original idea of Chopin’s, make sense of it, and convey his understanding to the audience? It is really sad what a vast collection of examples of unique and curious features of compositions, being neglected by almost every interpreter, could be put together. It may be added that Horowitz (or Rachmaninov, or Rubinstein, or any of the truly great), with all his rubato, never obscures the rhythm; our able listener will hardly ever have difficulties in determining the intended note values, and, upon writing them down, find out that his text will be virtually identical with the composer’s. Do I have to name any of those innumerable examples of pianists who seem to believe that rubato means the licence to distort note values at will? Of course, it is more convenient to refer to the interpreter’s licence rather than taking pains to study a text thoroughly. I have heard pianists saying: “I have worked with a number of composers, and you know what: They never really cared what I played; they told me to play as I felt was right. Their text just need not be taken that strictly.” Now, I cannot speak for anyone else but me, but I know that some musicians who studied my compositions with me will probably say something similar about me: It is not true, however. I have very precise ideas of how my pieces should be played, and these ideas are written down in the text (which took me lots and lots of nerve-consuming pondering over the details); but when I meet somebody who is so kind as to put practising effort into my pieces, I will certainly try not to annoy him any more than necessary; and when I see that his personality is different from mine in some aspect, I would not make him play in a way which is not his, but I will say something to the effect “Play as feels right to you”. Nonetheless, I might silently hope that some other personality, more similar to mine, come some day and study my piece anew … For many composers, by the way, the above-quoted statement seems highly improbable to me, given what a consistent, logical, and coherent picture emerges from an in-depth analysis of their text up to the smallest details. I always end up asking myself: Why on earth should Chopin have cared to write these accents (certainly bewildering to some) if they were not important to him? Or if he would have expected them to be inaudible? Or not clearly distinguishable from unaccented notes? And I cannot spare most pianists here from the accusation of either not having studied the text carefully, or having failed to make sense of it, or having failed to make their understanding actually reach the audience. Each major work of art is infinitely rich in content, which means that each interpreter can, and will, discover features that are truly and a-priori in it but have not been discovered before. Bringing out such features results in an interpretation that is both objective and personal. A memorable experience, for which I am grateful until today, was seeing Wagner’s complete “Ring” at Bonn Opera House in 2001. German opera stage directors tend to be as arbitrary in their “interpretations” as could possibly be conceived, but Siegfried Schoenbohm’s staging of Wagner was an admirable exception. It was full of highly original, entertaining, and creative ideas; none of these, though, were against Wagner’s work. In fact, they all, surprising as they were at first, just opened a view on what was really in the composition. When listening to audio recordings of Siegfried’s death in “Götterdämmerung”, I had always asked myself why, in the music, Siegfried appeared to die twice. Those heavy chords from the orchestra, indicating the event, occur not once but two times, each followed by the scary lines “Hagen, was tust du?” (“What are you doing?”) and “Hagen, was tatest du?” (“What have you done?”) respectively. In Schoenbohm’s staging, Siegfried rose in terror with the first chords, struck by Hagen’s spear, and broke down to the floor with the second. Now all of a sudden the double blow in the music not only made sense, but even more, the music appeared as if intelligently and aptly written for the action as seen on stage. Many more examples could be given to show how Schoenbohm’s interpretation, unusual and personal as it was, did not do anything but just bring out what had always been in Wagner’s work. To my best knowledge (and regret), no performance of this “Ring” has been recorded on video. Being personal is, by the way, unavoidable. It is therefore unnecessary to spend any time trying to be original and innovative (let alone, disregard textual details deliberately); you will inevitably be original, just because you are a unique personality. Instead, time should be spent on reading and understanding the text as deeply as possible; this task is nearly infinite. It is common practice amongst pianists to rewrite scores occasionally. Not every composer was every day at his best, many were not familiar with possibilities (and limitations) of the modern concert grand, and some were not especially familiar with the piano at all; therefore, the musical statement intended by the composer can at times be made more clearly by altering his actual text. A rather common issue, if thornier than it would appear at first, is the influence of a narrower keyboard on composition. In numerous places, composers avoided certain notes obviously for the sole reason that they were out of the range of their keyboard. The problem with this is that in many places this restriction influences not only this particular note but also its compositorial surroundings; composers were often very skilled in turning restrictions into highly sensible and coherent structures. So if we just change the single note in question we will, in a surprisingly high percentage of cases, disarray structures in the greater context. In many instances (probably the majority), I decided after some consideration to leave the text as it was (which led me again and again to fresh admiration of how good composers were in working with, and making sense of, limited possibilities). If contra E were to be heard only once throughout the whole piece, this unique instance would have to be the final E minor chord, not a note quickly passed by in the coda. So we will have to alter the ending as well. The obvious solutions, however, do not work well: Just lowering the left hand by an octave leaves a large gap between left and right hands, resulting in a somewhat empty sound, especially problematic with the narrow span of the right hand chord. The gap could be diminished by adding a lower E to the latter, but this changes the sound of it rather unfavourably; the narrow finger position and the fact that it consists of only three notes allow a clear and aggressive touch which seemed to me highly appropriate to achieve an authoritative sound in the comparatively low tenor register. In this version, the right hand keeps its clarity, the gap between hands is filled, and even the original left hand notes, great and small E, are contained in the resulting sound. Adding B seemed necessary to me because a triple E would again have made a somewhat empty chord. The first piano composer to make use of this tricky jumping device for a final chord with anacrusis was Rachmaninov, so my version is definitely not Mendelssohnian anymore; on the other hand, also our instrument is not Mendelssohnian, and when adapting earlier compositions to modern instruments we will always have to be creative. The idea that Mendelssohn, on an extended keyboard, would have changed just these two places, is probably misguided; more likely he would have written a completely different piece. In this case, the search for a Mendelssohnian solution for just two places will be futile from the first; but certainly we will not venture to rewrite the whole piece. Also, solutions are often personal; pianists who do not feel comfortable with the jump (which has to be played crisply in tempo, without any hesitation, and with good sound for all notes) will have to find other ways. Just as a cone put on its end is an instable construction, a cone-shaped piano sound makes me feel uneasy; melody and harmony lack sufficient foundation to rest upon. How important bass foundation is to every kind of music can be seen most drastically in examples quite far from piano music. In popular music, there is a style which is called Drum & Bass and in fact does not consist of much more than what the term implies; and still, it makes for complete music. Also in “classical” music, it may be noted that there is a number of outstanding compositions written for an orchestra consisting of violoncelli alone, but none for violins. Similarly, there is a vast literature for a cappella men’s voices, but comparatively little for women’s. And finally, much has been written for piano left hand, but (to my best knowledge) nothing for the right. All this is I think due to the fact that music can easily live without the high sound register, even without melody, but that lack of a bass foundation can never fully be compensated. As for right-hand-only piano music, the problem seems to be that the right hand could reach the bass register only in a very uncomfortable position and would simply not be able to produce a full sound, whereas the left hand is uncomfortable in the high register where no strength is required. It is interesting to note that in recording popular music it is common practice to level the singer’s voice down as far as possible so that it is only just audible over the accompanying instrumental arrangement. 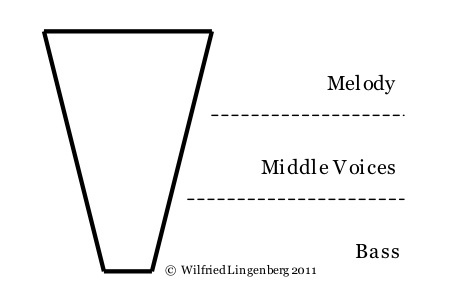 One reason is that a melody in high register need not be loud to be perceived. Similarly, bass lines in piano music can be played surprisingly strong without jeopardising the melody’s dominance. And a solid bass foundation combined with clear but unobtrusive middle voices will leave to the pianist all freedom in carving out the melody, making full dynamical range accessible: Soft melody tones will not be drowned in misty harmony, forte and fortissimo melody will not seem exaggerated when balanced by supportive bass. As a counterexample, take any of Horowitz’ recordings of this piece. And do not forget to admire Horowitz’ skill in not only giving substance and various colours to each of the bass notes but also to make these notes connect to living lines. If you promise not to be too disappointed about the obvious shortcomings in my playing you may also listen to my own recording of the piece. Put all recordings to the test and check whether bass notes are still audibly present at the end of their bars – as is required by Liszt’s text; he wrote semibreve notes, so the bass notes are to form a continuous line throughout the piece. 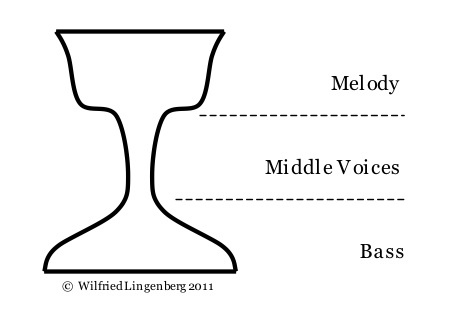 In many places, Lang Lang’s playing quite suggests quavers linked to the middle voices instead. 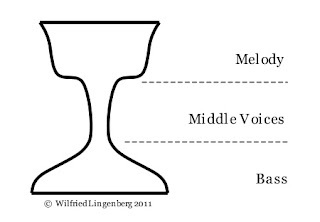 Note also that a “goblet-shaped” sound does by no means involve compromising in clarity and transparency of the middle voices. Astonishingly, Lang Lang’s recording comes in last even in that respect. Again, listen to contemporary Horowitz recordings to ascertain that the sound is not due to recording technology of the day. While there is no denying that Wilhelm Backhaus was a truly great pianist, I must say that I am glad that habits have changed and piano sound has been turned from its head to stand on its feet again. Recently I came across Dieter Rams’ Ten Principles To Good Design, and I was astounded by how precisely they apply also to the interpretation of piano music. All we need to do is replace the word “design” by “piano interpretation”, and “product” by “piece”. Good piano interpretation is thorough, down to the last detail. Well, basically we just discussed that; but it does bear repetition. And do not forget to practise, even that last tiny little note every other pianist keeps neglecting. Good piano interpretation is aesthetic. Seems fairly obvious. I might add, however, that aesthetics in interpretation (based on the pianist’s musicality and taste) is by no means sufficient in itself; it is quite well possible to play a piece most beautifully, but to fail to bring out essential qualities or statements of the music at the same time. None of the great composers was content with beauty alone; a piano masterpiece has more to it than just nice sounds. Good piano interpretation is as little interpretation as possible. Again, pianists, trust the composers and their pieces. Should you do too little, the music will still be there and have a chance to explain itself. If you do too much, however, the composers’ statements will at best be unhappily obscured; in worst case, the music will not be recognisable anymore. Do I really have to name those examples of interpretations distorting a piece beyond recognition by excessive, but misguided, rubato? Good piano interpretation is honest. Dieter Rams wanted industrial design not to make any promises the product would not fulfill. Maybe there is no obvious translation of this principle to the field of piano music interpretation, but it might well remind us that we should take care to apply appropriate means in their place and not present the composers for what they are not. Not every pianist resists the temptation to colour Mozart lines in subtle Chopin-like tones or to weave Ravelian sounds from Chopin passage work. Good piano interpretation is long-lasting. Obviously it is. The playing of the great pianists has always been in some way or another indebted to the traditions and habits of their time, and nevertheless their interpretations will remain valid. Yes, Paderewski’s Beethoven is deeply romantic and not ours anymore, and Backhaus’ or Haskil’s playing is typical mid-20th century in its overly cool denial of any sort of pathos; but yet we will find ourselves gratefully and admiringly returning to these recordings again and again. For warm-up before practising, I often sight-read my way through complete sets of major piano works, to enhance literature knowledge and to appreciate well-known works in their wider context. Beethoven’s Piano Sonatas were a natural choice at an early stage. What struck me already then was that virtually every piece in the series of 32 seemed to strive to reinvent the concept of piano sonata completely. In his Piano Variations, e. g., also Beethoven is perfectly content with developing continually further the basic concept once found and proven successful, as are Mozart, Haydn, and Clementi in their Sonatas. In Beethoven’s 32 Sonatas, however, only revolution seems to be good enough for each and every piece. Much later, I made an observation which seemed particularly telling to me: Several of the late Sonatas curiously seem to take off at exactly the point where the one before ended. Op 90 ends quite unusually in a beautifully calm mood and a steady movement in equal note values (semiquavers throughout). The first full beat of the main theme, occurring very often, and bar 276 for the last time, has a third G#/E, followed by B in the right, and an octave E–E in the left. 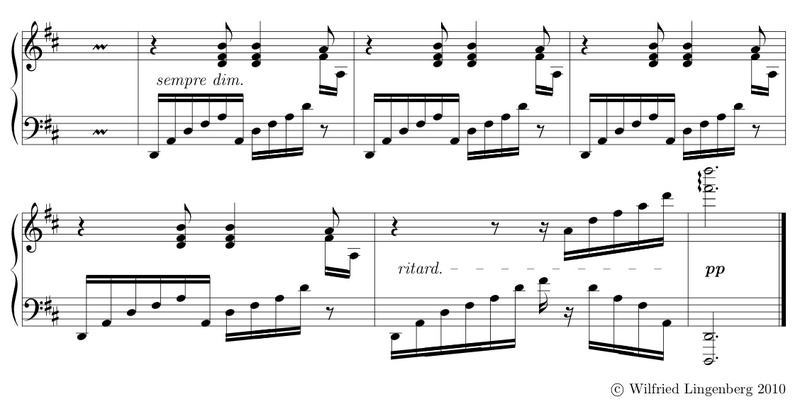 Now, op 101 starts with exactly the same figure, in a calm, continuous quaver movement — although this sonata is in A Major, so the chord belongs to the dominant here and it takes two bars to reach the actual tonality. Op 109 ends with this beautiful chorale-like theme in three quarters, the melody of which starts in tonica, falling from the third to the root, and establishing the dominant in the second bar with another falling third. So opens op 110. Since these Sonatas were neither written in close temporal sequence nor published together (except for op 109/110), I cannot but interpret this observation as betraying Beethoven’s determined will not to go back one single inch but to carry the concept of piano sonata as much forward as humanly possible. Whenever he tackled a new sonata, he was perfectly aware of what he had reached so far and took pains not to go any part of the way twice. The two exceptions from the rule are the end of op 106 (which probably did not leave anything more to be said in its wider surroundings), and the latest Sonata, op 111, the first bars of which do not seem to refer in any way to op 110 end; in fact, they strike a distinctly archaic note, and the idea of opening a C Minor sonata with an Adagio introduction is, in his Sonatas, as old as op 13 (where in turn the overall structure is almost certainly borrowed from Clementi op 34 no 2). On the other hand, a closing variations movement is a feature taken from his most daring experiment, op 109 — two more reasons to think of op 111 as some sort of resumé summing up his Piano Sonata legacy. Programme sheets and recording booklets often count three movements in Beethoven’s 30th piano Sonata in E Major, regarding the Prestissimo section as a second movement — despite the obvious parallel to Sonata no 32 with its two movements, also sonata form plus variations. This might be due to the fact that some rather substantial connections between the first section (Vivace ma non troppo – Adagio espressivo) and the second (Prestissimo) have not yet been fully appreciated. In fact, the Prestissimo turns out not to be a new movement at all, but a complementary reworking of the material of the first section. Both first subjects take their start from the same idea: The first section’s first subject opens with the pitch sequence G#–B–E–B–B, or a tonica triad sequence 3rd–5th–1st–5th–5th (first beat plus following note, both hands). The Prestissimo simply turns this motive into Minor key, replacing the first of the 5ths by a lengthening of the preceding note: GG–E–B–B, or 3rd–1st–5th–5th (first bar plus following note). The bass progression in the beginning is: E–D#–C#–B–A–G#–B–E, basically the descending tonica scale, with 5th instead of 2nd. The bass progression in the Prestissimo’s first subject is virtually identical; just that in two bars a passing tone and an “appoggiatura” respectively are added in half values: E–D–c–(a)–B–A–G–(f#)–b–E (passing tone and appoggiatura in brackets, half values in lowercase letters). Taking each of these similarities by itself, one might be tempted to ask whether they could be just coincidental, given the simple diatonal or triad structure of the motives. Seen together, however, I think there can be no reasonable doubt that Beethoven purposefully used the basic musical ideas from the first section as starting point for the second. So let’s have a look at what he actually does with them. What strikes listeners easily most in the beginning is the complete change of tempo, metre, and character after only eight bars. In fact, people interested in sonata form aspects will probably have looked very closely at motives, tonalities, and progressions in the whole section to make sure that it really is a complete sonata form, not just a free fantasy preluding to the Prestissimo as a real first movement — and to ascertain that the first eight bars are in fact the first subject, and the Adagio the second. In other words, Beethoven for once completely exaggerated the canonical contrast between first and second subjects. In the Prestissimo then, no contrast at all. Not only are tempo and character in the second subject seamlessly continued from the preceding bars, even its opening motive (bar 33sq) is no more than an inversion of an earlier transition motive (bar 9sq). Both ways of introducing a second subject – radical change of basic parameters here, continuity and recurring to already introduced material there – are not only opposite to each other, but also hardly compatible anymore with the basic ideas of organising thematic material in a sonata form. Beethoven seems to try to knock down opposite walls of the architecture built not least by himself. Finally, a glance at development. When I first came across op 109, I was startled by the fact that the development in the Prestissimo section just used the bass line of the first subject, but neither the first subject itself nor the second. For a self-standing sonata movement, this omission would hardly be explainable; the thematic material is characteristic enough to allow for interesting treatment, and there is little point in writing a sonata form with exposition and development if both do not share more than just a rather elusive feature. The answer, however, comes as soon as we accept that it is not a self-standing movement but a part of a larger structure. The development in the first section uses exclusively, and extensively, the triad motive; when Beethoven started the second section with yet another reworking of that very same triad motive, there was no way of reworking it for a third time in any sort of development. The second subject on the other hand is less idiomatic and, moreover, itself a reworking of earlier material. So the last (but brilliant) resort was to concentrate on the third element common to first and second sections, the first subject’s bass line (which luckily in its embellished form proves sufficiently characteristic) — and otherwise to keep the whole development thing as short as possible. Certainly, this experiment is the widest Beethoven ever bent the conventions of sonata form (note that also the form of the second movement, a series of variations, could hardly be less sonata-like). Further development (which in this case is nearly identical with further deconstruction) was not to be reached until late Romantic period. Amateur pianist, fond of thinking about piano music. You might want to check out recordings on my YouTube channel, but don't judge too severely. Please excuse language errors in my writing, I am not an English native speaker. And please excuse my long sentences, I am a German native speaker.